Holyoke Codes explores computational molecular biophysics with Northeastern University Professor of Physics Paul Whitford. In February Whitford led a series of workshops for high school students aimed at teaching them about computational molecular biophysics, an area of scientific research at the interface between chemistry, biology, physics, and computing. The six-hour series, held on February 13 and February 20, 2018, introduced high school students, familiar only with the concept of a molecule as a collection of covalently bonded atoms, to biomolecular structure (e.g. proteins and DNA) and how simulations may be used to study cellular dynamics with high-performance computing. The series drew eighteen participants from the Big Three STEM Pipeline Project of the Urban League of Springfield, Inc. Students ranged from first year to senior year high school students, and attend a variety of schools in Springfield. In the first session, students learned about biomolecules such as proteins and DNA and their functions in cells, visualizing these molecules using computer software. Students interacted with the visualizations, zooming in, rotating, and changing how the molecules were represented. 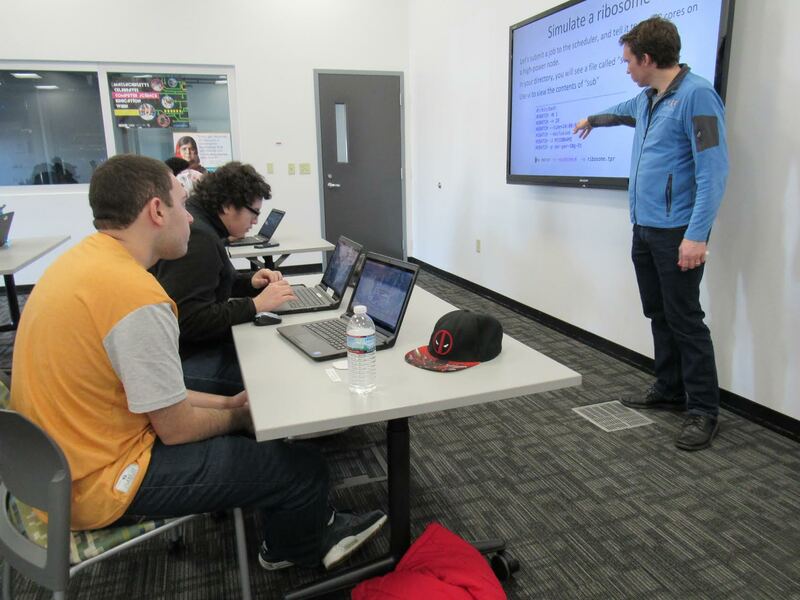 The second session introduced students to simulations and computing clusters. After a brief overview, the students performed their own simulations of a molecule, subsequently visualizing the trajectories of the molecule, to show how biomolecules move inside of the cell. During Session 3, the group discussed what a supercomputer is (i.e. why is MGHPCC so big!?). The students logged into a supercomputer and each performed a simulation that ran on many compute cores at the same time. To appreciate how powerful these machines are, Whitford had the students compare the simulation time using a supercomputer with the time to run on a desktop/laptop. 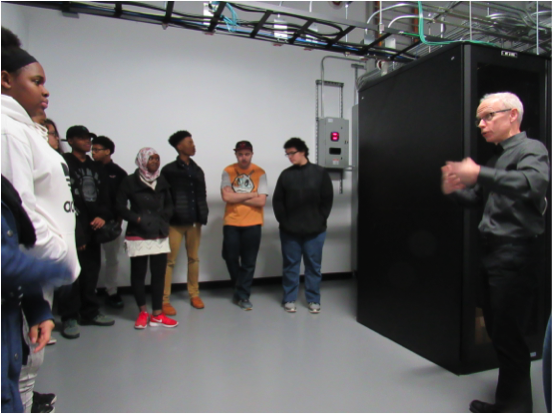 The students were also encouraged to think about the relative scale of modern supercomputers (millions of cores) compared with early supercomputers and how an iPhone is now more powerful than a supercomputer from 40 years ago. While the students’ simulations were running, participants toured the MGHPCC with Director of IT Services Jim Culbert, and viewed the cluster their jobs were running on. 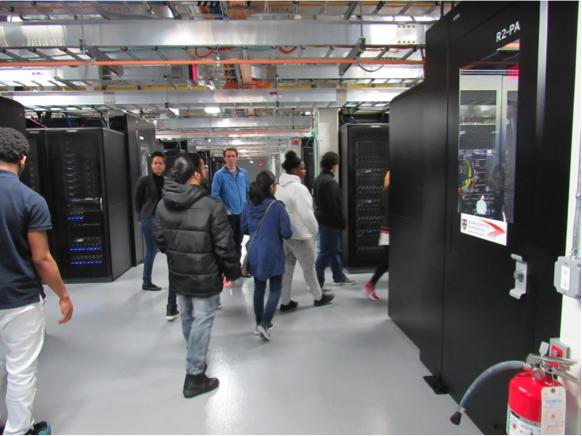 The Massachusetts Green High Performance Computing Center (MGHPCC), is a non-profit dedicated to providing state-of-the-art, environmentally responsible infrastructure for research computing systems. A joint venture between Boston University, Harvard University and Northeastern University, Massachusetts Institute of Technology, and the University of Massachusetts system, and located in downtown Holyoke, MGHPCC is an active member of the community and an anchor institution in the Holyoke Innovation District, which aims to catalyze the creative economy in Holyoke and the Pioneer Valley. Holyoke Codes is an education and outreach program of the MGHPCC in partnership with local IT educators and professionals. Our overall goal is to provide access to engaging and successful technology experiences for students who would not otherwise have this opportunity and to encourage participation in STEM activities in school and at home. Since 2014, more than 2,800 kids have attended Holyoke Codes workshops. To increase our effectiveness, we partner with the Holyoke Public Schools and other organizations including Girls Inc. of Holyoke, the Holyoke Youth Task Force, Holyoke Cultural Council, Holyoke Public Library, and Holyoke Community College.